Just wanted to share this inspiring video. Hope you enjoy it! Just a few pictures from what we've been up to lately. Nathan was being cute in the bath the other day and wanted to wear his bucket as a hat. I just love his smile in the picture! John and I went to his IV sedation course in Portland a week or so ago, and these are just a few pictures of him working after he got his IV's started. He did great starting IV's and we'll go back in a couple of weeks for another busy weekend. I went along to kinda help with the assistants with the medications. I'm glad I went and was able to help. We stopped at Multnomah Falls on our way back from Portland, it was really cold when we were there, but I definitely want to go back and hike up closer someday. It was beautiful! Grandma took him on a picture taking adventure...this is just one of many! 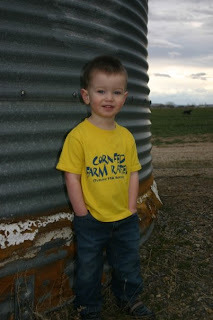 I love his hands in his pockets...supposedly he did that on his own! 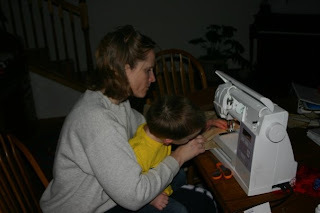 He liked to sit on Grandma's lap while she sewed. This was taken right before they left to come to the airport to get me. He took his little backpack on wheels for the trip and he just looks so cute strolling it along behind him! 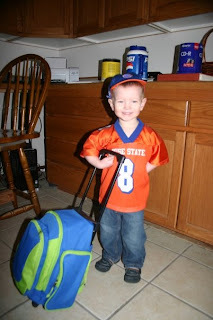 He is dressed in Boise State garb (thanks to Gma and Gpa). Go Broncos! I was so excited to see him at the airport Saturday morning, I didn't realize how much I had really missed him until then. I had to swallow back my tears! :) He was really happy to see me too and that was nice because when we were gone I tried to talk to him on the phone and he refused. He told my dad, "No talk Mommy!" We were in Puerto Vallarta for a week with John's work. We had a great time. Nathan stayed in Parma for a week and I will post some pics from his time there!